When teaching your students how to multiply decimals, it is best to begin with multiples of 10. 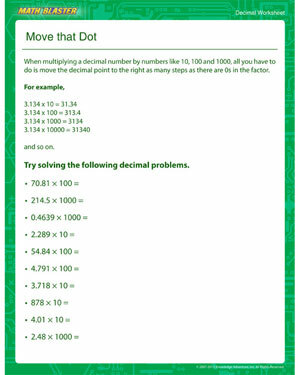 The simplest form of decimal multiplication, multiplying decimals with multiples of 10 is done by moving the decimal point to the left as many places as there are zeros in the multiplier. Use the examples at the beginning of the worksheet to help your fourth grader understand this concept. Then use the multiplication problems to see how much they have understood. You can also check out our decimal worksheets on other related concepts.